Asserting that the time has come to move away from 'fancy rhetoric', Sri Lanka yesterday said Saarc must become a Union and adopt a single currency for achieving its political and economic pursuits. "I strongly believe that Saarc must become a Union where we will endeavour to achieve our political and economic pursuits. It is also high time that we adopt a single currency," Sri Lankan President Mahinda Rajapaksa said in his speech at 14th Saarc Summit. Rajapaksa said adopting a single currency would enhance productivity of the region and improve trade without barriers. He said while countries, particularly in Europe, have formed regional blocs despite major differences in language, culture, religion and income levels, Saarc has not realised its potential. "I am particularly concerned that Saarc has not realised its enormous potential yet," he said adding that time has come for action and relentless effort to meet aspirations of the people in the region. Referring to menace of terrorism, the Sri Lankan president said the recent air attack at Katunayake by the LTTE must attract attention of the Saarc leaders. "The recent attack at Katunayake by the LTTE must attract attention of all of us to the fact that our region as a whole is not safe from the barbaric terrorist groups," he said. 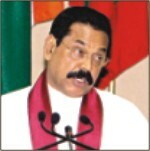 Rajapaksa said the Saarc countries must work jointly on a counter terrorism strategy for the entire region.